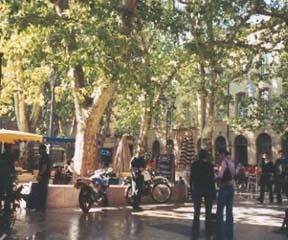 The local train left Marseille at 11:35, arriving in Aix-en-Provence at 12:18 at the main train station. The TGV station is out of town; we departed for Paris from there at the end of our stay in Aix. It was a pretty walk until we got to Place du General de Gaulle and our first look at the Fontaine de la Rotonde and Cours Mirabeau, then "pretty" became gorgeous! La Rotonde was erected in 1860 on the site of the former Porte Royale, for centuries the main entrance to the city. The fountain is a symbol of the entrance of modern-day Aix, with its new avenues forming a star shape, and its three statues carved in marble representing the city's essential professions - law, the arts and agriculture. 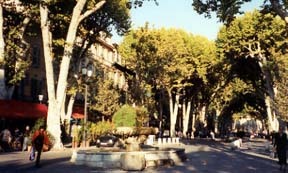 The plane trees around the square continue the length of Cours Mirabeau, forming a majestic canopy over the busiest street of the city. Cours Mirabeau was originally designed to allow the passage of carriages. Lining the way are magnificent private mansions, noteworthy cafes and lovely fountains. It is not only the crossroad of town but it's a boulevard that beckons you to walk up and down to discover all its hidden charms. Our hotel De France was on 63 rue Espariat, which runs through the small, active, Place des Augustins, but unfortunately the grumpy owner has not seen fit to properly maintain, let alone refurbish, the property. We stayed away as much as possible, which was easy to do in this fabulous city. Aix is a relatively small town making it easy to stroll and encounter its cultural and architectural riches. It's a non-stop voyage through time. Imposing buildings, magnificent stone squares, striking fountains and gardens and all along the way there are fun shopping and pedestrian streets and never-ending outdoor markets of the freshest products and creative handicrafts. Place d'Albertas is like a theatrical scene. A vast elaborate rococo-style mansion surrounds the square with an attractive fountain in the center. It's a magical sight that stopped us in our tracks. 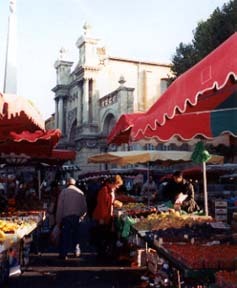 When we got to the Place de Verdun and the imposing Palais de Justice, we found the square filled with antiques, produce, clothing, shoes, house wares, etc., and were to find a steady stream of markets as we meandered through the streets and squares of the old town. This is a shoppers paradise, wonderful products in the shops and on the street in a beautiful environment. It is impossible not to become a buyer. There is a Provencal expression "radassa", which means sauntering and lingering, being pleasantly surprised, coming unexpectedly on something wonderful and so typically "Aixois". "Radassa" it was! Place Richelme was a heart-stopper. It is a symmetrical square, surrounded by handsome, tall buildings, the most famous being the corn exchange. The southern facade overlooks the square with its rich decorative motifs associated with the purpose of the building - fruits, cereals and olives. There is a center island filled with plane trees, which are also around the perimeter. The shiny stone floor of the square melds the greenery and the architecture, creating a sense of comfort and pleasure. You can find a fresh produce market here every morning. Just behind Place Richelme is La Place de la Marie dominated by the Town Hall, a classic seventeenth century design with an Italian facade, paved inner courtyard, wrought ironwork and twin winding staircases leading to the Salle des Etats de Provence. Next to it is the clock tower, marking time with the chimes of its astronomical clock where personifications of the four seasons appear in turn. The old Bourg Saint-Sauveur runs between the old ramparts and the Tourreluque Watchtower, the last vestiges of the medieval fortifications. 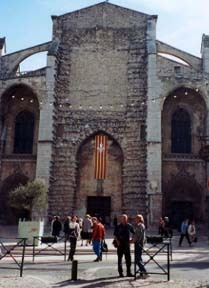 Its crowning feature is the Saint-Sauveur Cathedral, a unique example of blended styles of religious architecture - Roman foundations, Merovingian Baptistery, Romanesque Nave and Gothic wave. The carved wooden doors from the sixteenth century, the triptych of the "Burning Bush" by Nicolas Froment, and the twelfth century cloister add to the architectural diversity. Nearby is the Archbishop's Palace with its elegant Regency door. Opposite the Cathedral is the lovely University Square, where the old law faculty was replaced by the Institute of Political Studies. La Place des Cardeurs was opened in 1963 on the site of the medieval Jewish quarter. It is now dotted with restaurants and cafe terraces in a sea of greenery. On this beautiful day, the chairs were filled with young people enjoying the lovely, peaceful surroundings. Rue de la Coronne, across from our hotel, has many recommended restaurants. The one we thought of going to no longer exists but the night clerk at or hotel (he turned out to be the best asset of the hotel) told us that its replacement had very good food at fair prices. So it was that we went to Le Bel Air, 7 rue de la Couronne, Tel: 4-42-93-42-96, to find our man was right-on. We chose the three-course 17 EUR menu. I had a killer entree of assorted meats and pate with oodles of pickles, olives, baby onions and radishes. Linda kept healthy with a beautiful vegetarian plate of eggplant with tomato sauce, chick peas with cumin, and assorted marinated peppers arranged nicely on a bed of lettuce. She continued her smart dining with heaps of mushroom ravioli in tomato sauce and I didn't do too badly with a cassoulet de fruits de mer, a good size pot filled with fresh clams, shrimp, calamari and mussels in a luscious, natural seafood broth. The side plate of white rice with steamed carrots, zucchini and mushrooms was an ideal accompaniment with the cassoulet. We had started with the house pate crostini and finished with tart tatin. Le Bel Air is family-run with excellent, caring service and a pleasant, pale yellow and soft red environment. This was an outstanding value. Just up the street at 51 rue Espariat is Boulangeries Paul with excellent baked goods and pastries. This is where we enjoyed our breakfasts of raisin, walnut or olive buns with freshly brewed coffee every morning. Today we would finally meet our Internet and Ziner friend, Frieda Lekkerkerker, who has settled in Provence and become an ardent advocate of the region with her own web site, About Provence, which is informative, up-to-date and well-written, as one would expect from a published author! Frieda's first mystery novel takes place in Provence; it was published in Dutch in Holland. The title of the book is De laatste kus (in English The Last Kiss), author: Sophie Clement. We're waiting for the English translation. Frieda had suggested she would pick us up and take us on a tour of her beloved Provence. It was a wonderful day and when it was over, Frieda wrote a message to TheTravelzine detailing our time together. She has given us permission to include her message here. I've returned from a wonderful day spent with Don and Linda. I picked them up in Aix-en-Provence, 20 minutes late, because I got completely stuck in the inner-city traffic. They forgave me, I hope. I had suggested to them to take advantage of my car and see the hinterland to which they agreed. We first drove to St. Maximin, a medium-sized town (by Provence standards) of 8000 inhabitants, completely dominated by a Basilique (of the 12th C), built for the relics of Mary Magdalene, who supposedly washed ashore with a few friends at Sts Maries-de-la-Mer. Her skull (most likely someone else's) is ornately displayed in a crypt. As an aside, relics were vital business in the Middle Ages, attracting pilgrims as today's resorts attract tourists. The Basilique also has one of the best organs in France, saved from demolition by Napoleon's brother Lucien who spent a year in St. Maximin. During the Revolution and Napoleon times, churches were closed and worship forbidden. The Basilique then was used as an armory, the precious wood and metal of the organ eyed as great sources for other means. Lucien, however, recognized the quality of the organ and had the Marseillaisse played on it every day. Next to the Basilique is a Dominican monastery, to house the monks who supervised the relics of Mary Magdalene, until the 1950's. The monastery is also of the 12th C with impressive cloisters and courtyard. Recently, it has been converted to a hotel and an upscale restaurant. I had eaten there a few times, when the prices were very reasonable (and the food extremely good), but today I discovered that the cuisine must have found its followers and as a consequence adjusted its prices. Plus, it was closed today. Later we wandered about the old quarter, with houses bending over from age, beams rotting away, even charcoaled with a whiff of smoke. It's called the Jewish quarter, though there are no direct references. The only plaque we saw was on a house that told of Lucien Bonaparte's presence there. At least, he saved the organ. After St. Maximin we drove to Le Val, a village I discovered only two weeks ago (there are hundreds of villages in Provence, I'm discovering new ones as time goes by). What attracted me was the quiet in the village, the typical Provence elements of plane trees, narrow streets, surprising vegetable gardens (the area is called Provence Verte, because of the abundance of natural sources), an authentic Norman church. The village has a Provencal restaurant, where we had lunch. Don and Linda will certainly comment on that. After a long and leisurely lunch, we walked the streets of the village, stumbled on an atelier of a santonnier, maker of Provencal figurines. From Le Val we drove to Barjols, a town renowned of its water sources (water in Provence is liquid gold) with 32 fountains and lavoirs, communal wash basins. While inspecting one of the most impressive lavoirs, we were stopped by a man who asked if we would like more information. He had a camera in hand and an impressive camera bag over his shoulder. Instinctively I thought this was a tourist trap, someone who takes your picture and charges a fortune. Then he introduced himself as the director of the local museum. He gave a wonderful exposé of the waters in Barjols. While I did my best to translate, Don took notes. It's one of my regrets that we didn't take pictures of that scene. In town we visited the church with, again, historic relics, saw more of the fountains, some of which are quite impressive. From Barjols we drove farther into Provence Verte, to Tavernes and Varages to visit a factory of Faience, Provencal pottery. Though Don and Linda would have loved to buy the lot, there was no way to cram even a large plate into their luggage. In all, it was a great day to enjoy the presence of this wonderful couple. Frieda, of course you are forgiven for being late! Let me tell all of you about the lunch we had with Frieda, who knows how much I love to relive these pleasures. As she pointed out, Frieda had only recently discovered the village of Le Val and at the same time she had found La Cremaillere, 23 rue Nationale, Tel: 4-94-86-40-00. 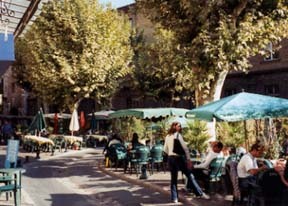 The restaurant is as lovely as the village, with typical Provence ambiance, thick, yellow stucco walls, wooden ceiling, colorful Provence paintings and print tablecloths. Linda said her fish soup to start was the best yet. Frieda's seafood salad looked awesome and she confirmed that it tasted every bit as good as it looked. My salad greens and assorted vegetable plate were garden fresh and delicious. All of us were delighted with our mains. Linda had a fluffy mushroom omelet but Frieda and I opted for fresh fish; salmon filet for her and filleted, grilled loup for me, both served with wild rice and mushrooms. Of course we had enough room left to do justice to a lovely presentation of chocolate cake, orange sorbet, custard and fruit tarts. The service was superb, which made our lunch a delightfully leisurely experience, just as one would dream about in the heart of Provence. Frieda's knowledge and passion gave us insights and perspective that we probably would not have found on our own, even if we did have a car. Besides, she was a joy to be with and to get to know personally. On the south side of Cours Mirabeau is the Mazarin Quarter. It's a complete contrast to the old town in that it was conceived in a grid pattern in the seventeenth century by the Archbishop Mazarin, brother of the Cardinal. 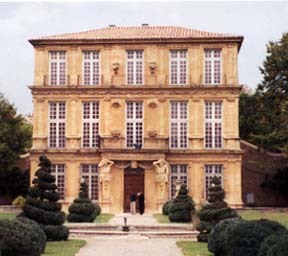 It was here that luxurious mansions were built, with secluded gardens, for the aristocracy of Aix. The Quarter is organized around two principal axes, rue Cardinale and rue du 4 Septembre. At the junction of the two is Place des Quatre Dauphins, shaded by huge chestnut trees in the middle of which is a fountain decorated with four dolphins. There are sumptuous mansions on all sides. The Hotel de Caumont on rue Joseph Cabassol is quite impressive outside and in. It was built between 1715 and 1742 as a private home. Today it is the Darius Milhano Conservatory of Music and Dance. The Granet Museum is situated in the former Palace of Mazia and named after the Provincial painter Granet, who was its main donor. Besides a nice collection of vestiges of Roman Aix and works by Cezanne, there is a portrait of Granet by Ingres that is very special. The museum will be closed for three years for extensive renovation and enlargement. Next door to the Granet is the fortified Gothic church of Saint-Jean of Malta, which was built at the end of the twelfth century. Back in the old town on our way to Vendome Pavillion, we stopped at 19 rue Gaston de Saporta, the Hotel de Chateaurenard from 1654, which contains a brilliant staircase painted in trompe-l'oeil by Daret. The handsome Vendome Pavillion dates back to 1665 and was the first home built just outside the city. It is preceded by a splendid French garden. The two telamons adorning the facade are a masterpiece by Rombot. The pavilion museum houses furniture and paintings from the seventeenth and eighteenth centuries. Nearby is Les Thermes Sextius, The present building stands on the site of the Roman baths of Sextius. Excavations have revealed a Roman thermal bath, which you can see as you enter the new spa complex. In our wanderings we came across La Table Marocaine, 10 rue Constantin, Tel: 4-42-96-05-54, which featured tagine as well as couscous and looked like a neat spot to enjoy this comfort food. What a marvelous choice - they work wonders with their spices. The lamb was tender, the fresh vegetables cooked to perfect doneness and the couscous just the right texture. Linda had lamb and vegetables (lots and lots of veggies, which she shared with me) and I had the lamb with prunes and almonds. In fact, there was lots of everything including excellent service. A local Domaine de Glauges was light and fruity. This is wonderful Moroccan dining at extremely reasonable prices. Until next time, au revoir Aix-en-Provence!